When Activision claimed the X-Men license at the start of the new millennium, they didn’t do anything terribly exciting with the license prior to the ground breaking X-Men Legends in 2004. The first Mutant Academy game and its sequel were fine, but they were more or less just a Street Fighter clone with a 3-D coat of paint, again not that there was anything wrong with that. When the Game Boy Advance launched in 2001, Activision was not too far away from launch with both of their newly purchased Marvel licenses: Spider-Man and the X-Men. 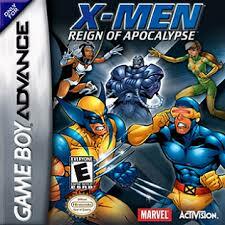 For the X-Men’s debut on the GBA, X-Men: Reign of Apocalypse, Activision partnered with developer Digital Eclipse to craft a game that emulated the at the time most well regarded X-Men game, the arcade beat-em-up from Konami. Unfortunately the genre is the only thing this dull brawler has in common with the Konami classic, as Apocalypse is a prime example of how monotonous and boring the beat-em-up genre can be at times. Upon returning from a mission in the Mojoverse, the X-Men return to their home to find that identical copies of themselves lie dead on the ground. The team quickly discovers that they’re somehow stumbled into an alternate universe where one of their greatest foes, Apocalypse, has taken over and now they must figure out a way to return to their real home and escape this nightmarish reality. I won’t really critique the story that much in Reign of the Apocalypse because not only is there not much of one, but you also never really look to the genre for a compelling narrative as it’s one where one of the classics is about a former wrestler turned mayor who takes to the street to beat-up identical looking goons. The story is serviceable at best and it does the trick in justifying moving the X-Men from one familiar location to the next. Like the story, there’s not that much to get into in the gameplay department of Reign of the Apocalypse as it’s remarkably basic, and not even in a good way. You have a basic punch attack that doesn’t feel that good to pull off as only one character, Storm, has an attack that chains into multiple hits, with every other character just love tapping enemies softly until their power drops to zero. 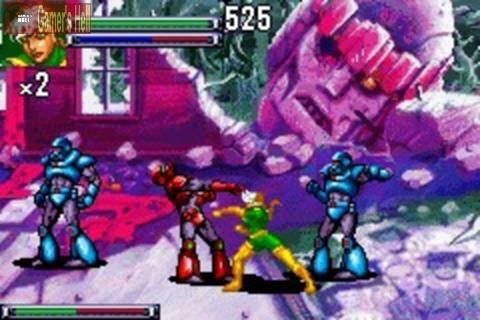 Each character has two variations of their mutant abilities: a basic attack such as a tornado with Storm or an up close optic blast with Cyclops that just drags out each encounter longer than what they already feel like as they do little damage and cause enemies to fall down such that you have to wait for them to pick themselves up before resuming your attack. The second is used when you build up enough stamina to unleash a more powerful attack that deals much more damage and covers a greater radius. Those expecting these to feel as exciting as the 90’s arcade game with its screen filling projectiles will be let down as even these don’t feel that much more powerful than simply punching enemies to death. Between stages you can commit points to a skill tree to level up one of three attributes: your health, your attack or your mutant powers. You’re only given two points per level to commit through the twelve level campaign and you’ll come nowhere close to maxing out any abilities. This doesn’t seem to really matter that much though, as Reign of Apocalypse is not that challenging of a game. This also means that you can’t switch between characters throughout the campaign when you die, which is a let down and reduces experimentation. Through the campaign you’ll fight waves of similar thugs and fight bosses in the forms of well-known X-Men villains like Magneto, Pyro, the Blob and of course the title villain, Apocalypse, as well as evil versions of X-Men you can’t unfortunately play as like Nightcrawler, Colossus and Angel. Whether you’re fighting an evil X-Man, mutant or generic goon, everybody feels the same threat wise. Most of the bosses, including the final one I might add, can be toppled by merely keeping a relative close punching distance and just waiting for them to not get up. This makes the bosses, things that are meant to challenge you, even less threatening than the fodder as at least they have numbers on their side sometimes. What saves X-Men: Reign of Apocalypse from being completely forgettable is its visuals which are pretty nice. The backgrounds are colourful and varied, bringing you from interior of the X-Mansion, to the lush green Jungles of the Savage Land and the island of Genosha. One thing I felt was lacking in the environments was a sense of movement, but this was only really in one level where you’re fighting on top of the Blackbird and it feels like it’s simply frozen in place and not soaring through the air. the sprites for the characters are even more aesthetically pleasing than the stages as each X-Man, boss and goon have a great amount of detail and lots of frames of animation. When I saw previews for X-Men: Reign of the Apocalypse in publications like EGM when it was new, I was really looking forward to it as at the time. 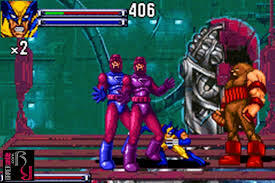 Activision hadn’t really done anything too terrible with their super hero games and the idea of an X-Men beat-em-up on the go seemed like a great idea. Outside of some nice looking backgrounds and characters though, Apocalypse is as generic as they come, even with the X-Men and all their fantastic abilities. Skip this one and track down a better game like X2: Wolverine’s Revenge instead.